Visual arts blog: drawing, painting and photography. 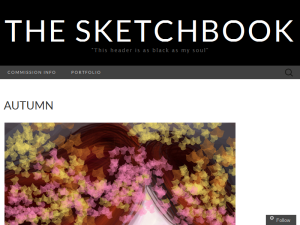 This what your The Sketchbook Blog Ad will look like to visitors! Of course you will want to use keywords and ad targeting to get the most out of your ad campaign! So purchase an ad space today before there all gone! No witty commentary, as I’m posting this during a Poro King game. 2011 vs 2015. I can never get enough of these! ❤ If I could get away from the “Meh, I’m bored. Let’call this finished and start another” mood, before I start adding details, that would be great. 2011 vs 2015. I can never get enough of these! If I could get away from the “Meh, I’m bored. Let’call this finished and start another” mood, before I start adding details, that would be great. I don’t always fangirl, but when I do it’s because of H.I.M. Long time, no posts! (well, except for the ones I’ve made like 2 mins ago). I had some problems with the site/pc and couldn’t properly upload images to WordPress, so I’ve kind of switched to Tumblr (feel free to check it out – it’s my most active platform at the moment – http://hyanide.tumblr.com/ ). Did these a few months ago but was waaaay to lazy to properly upload them. I don’t always have a crush on a fictional character, but when I do, fan art ensures! If you are the owner of The Sketchbook, or someone who enjoys this blog why not upgrade it to a Featured Listing or Permanent Listing?